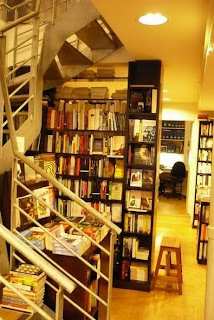 Gridskipper said: "A cramped two-level bookstore in St-Germain-des-Prés, the Village Voice Bookshop stocks 18,000 titles, with an emphasis on literature, culture, politics and contemporary social issues. Owner Odile Hellier, a knowledgeable French woman who loves to speak English, founded the store in 1982. But don't be surprised if the (native-English-speaking) help insists on speaking French." The Village Voice Bookshop is a well-established institution, which has served as a meeting point for American, British or Australian expats ever since its opening in 1982. A bit surprisingly, this bookstore wasn't founded by an expat, which is quite common for exclusively English bookstores on the continent. Its owner Odile Hellier is French, but her reputation of an expert in American and British contemporary literature in France is well deserved. And the fact that Village Voice has been ranked as the best independent literary bookstore in Europe by the British magazine Bookseller back in 2000 proves that she's doing her job very well. Odile Hellier is very passionate about books and her bookstore and that is precisely what makes the offer at Village Voice special - the number of titles on their shelves is somewhere around 18 thousand, but you can be sure that each one of them has been carefully selected. This bookstore has secured its place on the Parisian English scene already in the 80s, and it has hosted many big names of the American and British literary scene who came to read and discuss their works. Luckily, this tradition is still alive in this bookstore up to this day and readings take place on regular weekly basis. The neighborhood Saint Germain de Prés used to be called le village, and it was famous for its literary cafés, bookstores and publishing houses - the hangout of all the local writers and book-lovers. Times have changes but Village Voice Bookshop remains and honors this legacy.